Take time to reflect on the past year as a couple and briefly journal about your favorite memories, trips, marriage goals and more! It’s an easy way to write about your relationship and life and have something tangible to look back on year after year. Enjoy a nice date night at home together looking back at the previous year and setting goals for the future! We are big champions for at home date nights here at The Love Nerds! As parents of a toddler, it has now become a necessity, but we’ve been doing it since we got married. With tight budgets, going out just isn’t always feasible. 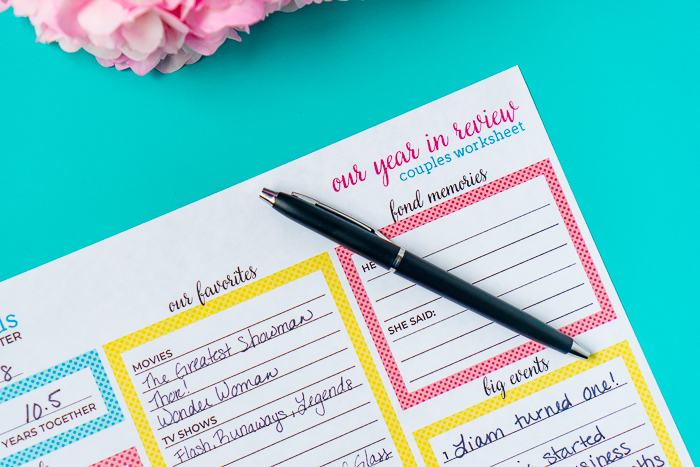 So if you are looking for ideas beyond this Couple’s Year in Review marriage worksheet, you will definitely want to check out our other posts on date nights. I first made this couple review worksheet a few years ago as part of my 14 Days of Love for Valentine’s Day. We had 14 at home dates from February 1st to Valentine’s Day. It wasn’t always easy to rally and not just hermit to bed in my pajamas, but it turned into a really nice experience for us. We didn’t spend every minute of every night together, but we did spend time connecting and sharing every night. We all don’t do that enough, especially in this realm of technology. Well, with a crazy January, we’ve decided to do 14 Days of Love again this year with a small change – we will be spreading our date nights at home out throughout the month of February instead of all in the first 2 weeks. I sat down to start updating that Valentine’s Day activity for us and realized our year review sheet could also use a little sprucing up! This Year in Review marriage activity was one of our original date night at home ideas. It was the first time we’d ever done it, but we genuinely loved it and have added it into our anniversary traditions. To be fair, both of us are trained in education so I think “reflection” is probably ingrained in us more than other people. 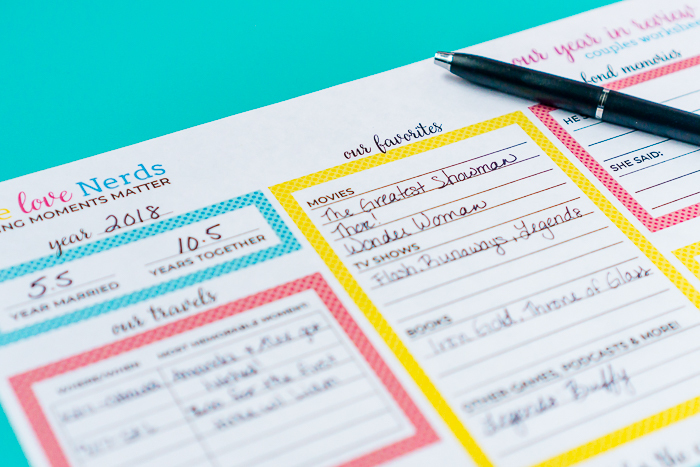 But this sheet gives you and your partner an opportunity to reminisce on the good times from the preview year and reflect on what worked or didn’t for you as well as set marriage goals for the coming year and even choose a Marriage Word of the Year. Here is what you will find on the Couple’s Year in Review worksheet. The link to download your couple review sheet is at the bottom of the post! How many years together as a couple? A section to reflect on how many years together and how many years married. Many people stop acknowledging dating anniversaries after marriage but we don’t. Our dating and engagement periods are important parts of who we are as a couple, so we still acknowledge our dating anniversary with a trip to Chilis every year which is the restaurant where these two crazy college kids had their first date. What were the big events that happened this year? Mark down all the big events for the year, as both individuals and a couple. If this happened to be a super eventful year for you guys, continue on the back. The biggest thing here is to not not to critique your partner’s individual big events; if it is important to them, it should go down. What are your favorite moments and memories from the year? We realized that some of the events or moments that came to mind wouldn’t really be considered “big”, but they were important to us. For example, we had a really great weekend with one of our best friends – fond, not necessarily BIG. OR, we wanted to more specifically define something we loved about a big event. Big event – our first wedding anniversary. Fond memory – drinking complimentary champagne on our hotel balcony as we watched the sunset over the harbor. Make whatever distinctions make the most sense for you. Where did you travel to this year? We may not always have the money to travel as much as we’d like, but we definitely want to remember where we have been! As more and more years pass, it gets harder to remember exactly what we’ve all done or when we did it. It all starts to blur a little bit. Marking down our travels as a couple or even individually makes a nice journal entry to look back on when we’re older. I also love this DIY States Travel Map! What were your favorite things this year? This is another category for the couple review that we added because we knew it would be fun to reflect on in the future. We will be able to look back and see what our favorite shows were or the big movies of that year, but even more importantly, our kids will be able to and probably laugh at us. What are your life and marriage goals for the coming year? I’ve talked on the blog a lot about the importance of setting goals, both professionally and personally. It gives us focus. Plus I’m also a firm believer in writing things down so I’m held accountable for them. So far this year, two of our goals are moving this year to a new place and having more date nights out of the house in 2018 which also means finding a babysitter! What is your Marriage Word of the Year? 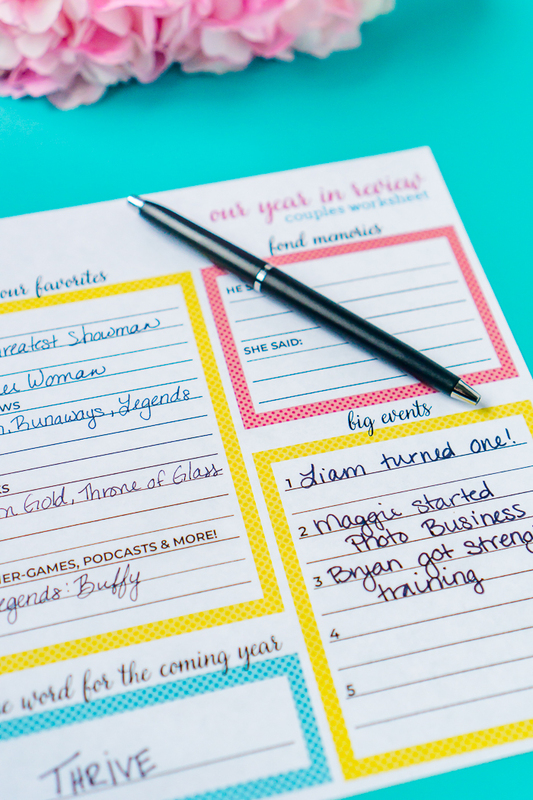 I pick a word of the year for myself every year and have even shared a worksheet for choosing a yearly word on the blog for all of you, so I decided to add it this time around to this marriage worksheet. If you want to learn more about why or how to pick a word, make sure to read tips on choosing your one word. What Can You Do with Your Yearly Review Sheets? Since, we created an anniversary journal which is now when we complete this sheet every year. We use a Project Life Album and pocket pages to put photos from the year, our review answers, and more! You could also find a nice binder to place them in after hole punching. Buy a memory box to store them as well as other keepsakes from throughout the years. DOWNLOAD YOUR COUPLE’S YEAR IN REVIEW PRINTABLE NOW! This is a cute idea! Would be fun to look back at a few years’ worth of these forms, too. I love this idea!! So cute! This is such a fantastic idea! Especially on days where you aren’t feeling that great about your relationship you can look back at all the wonderful things that have happened and what you plan to have happen in the future.